DURHAM, N.C. – The wealth gap between households of seniors and those with children has ballooned since 1989, a new study finds. 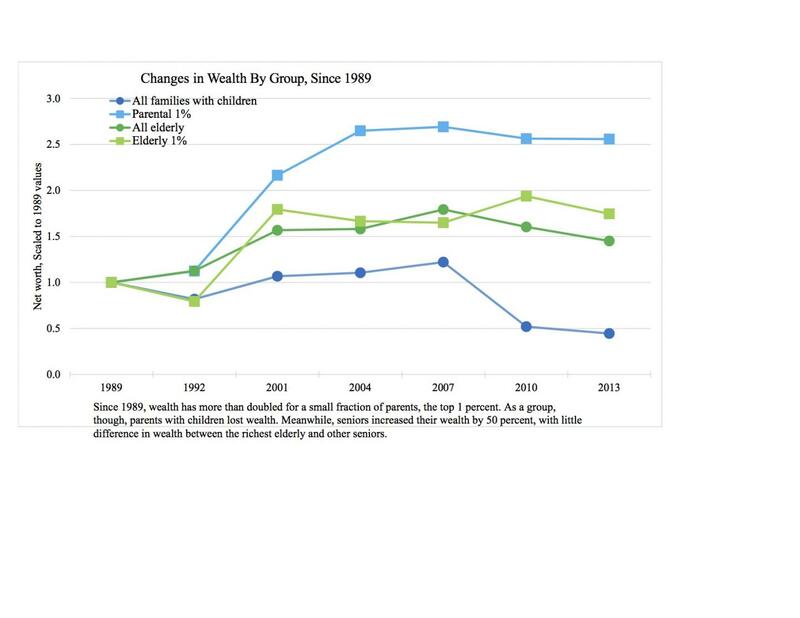 Also, wealth is now spread very differently within each group: The gap between the richest and poorest seniors has remained stable, but a vast economic divide now exists among families with children. Among the wealthiest parents — the parental 1 percent — average net worth increased by $3 million between 1989 and 2013. Meanwhile, a third of all families with children have negative net worth due to debt. Families at the bottom of the wealth distribution have it hardest, said Christina Gibson-Davis, associate professor at Duke University's Sanford School of Public Policy, who co-authored the paper with Christine Percheski of Northwestern University. "If your net worth is in the red for $233, you are pretty stuck as a parent. You probably can't provide much for your child, much less think about sending her to college," Gibson-Davis said. The study, "Children and the Elderly: Wealth Inequality Among America's Dependents," appears online in the journal Demography. The researchers analyzed data pertaining to 41,500 households from the Survey of Consumer Finances from 1989 to 2013. The survey conducted by the Federal Reserve Bank is considered the best source of household wealth data for the United States. In 1989, senior households' median net worth was approximately 3.8 times greater than the net worth of households with at least one child under 18. By 2013, after adjusting for inflation, senior households' median net worth was 12.5 times greater. "We knew that the elderly had more wealth than younger families. What we didn't know was elderly households have seen increases in their wealth, while families with children have lost wealth," said Gibson-Davis. Several factors contributed to seniors having greater wealth. Since the early 1980s, the United States has directed far more social welfare dollars to those over 65 compared with those under the age of 18. Seniors are also protected from declines in purchasing power because their Social Security income is indexed to keep up with inflation. The elderly also had lower levels of debt than households with children. They purchased and paid off their homes before the housing crisis of the late 2000s. In contrast, most parents saw little gains in wealth. Labor market changes led to declining wages for lower-skilled parents. They took on more debt, in part to pay for rising education costs. The Great Recession and the collapse of the housing market led to many being underwater on their homes, the primary asset for most families. There was also rising inequality among households with children during the period. Those in the top 10 percent of wealth, especially the top 1 percent, had large increases in net worth, with rising income, increased home equity and large returns from the stock market. Meanwhile, households at the bottom of the wealth distribution had declining income, increased debt and loss of home equity. In 2013, the least wealthy 90 percent of families held less than 20 percent of wealth, compared to 42 percent for the parental 1 percent. "The good news in our study is that wealth has increased for poor and working-class elderly couples," said Gibson-Davis. "The bad news is that wealth has not increased for poor and working-class families with kids. Many households with children simply don't have the resources to successfully raise the next generation." The research was supported by a grant number 1459631 from the National Science Foundation.